Indian story in most fields is of a rebel coming over, changing the ways for the masses and bringing about some changes, good or bad. From Buddha to Gandhi, Pataudi to Ganguly and Dhoni the leadership has mostly succeeded only when the things are done out of ordinary, shouldered by someone extra ordinarily determined and different. Talking about cricket, I was obviously not born to be able to comment much on Pataudi. Ganguly was the first time Indian cricket got an arrogant, in-your-face “Prince” to give back to the cricketing world what was recieved, mostly along with interest. Indian cricketers, just like the Indians were supposed to be spiritual, calm and composed, and sure we did have many such legends over the years. But the first major international success was achieved under a Haryanavi, while a phase of global respect came only under a person ready to antagonise anyone to serve his purpose.. So Not Indian, so many noses quivered and too many questions were raised over Ganguly, he just haughtily shooed them away. Until ofcourse age caught up. Dhoni was the other rebel, coming from a small town, a wicketkeeper who was the example of crude and power… Sooo Not Indian, where went the wrists and blades and glances, the powers of Indian batsmen, we all sighed. And yet did he come and conquer all, the Captain Cool with his calmness won over most of the critics and earned grudging respect from the critics who still couldn’t accept him. Until, of course, time caught up. Cometh Kohli then, DTC (Delhi ka Typical Chutiya) sala, bursting into 5 min abusathon at the flutter of a bird or the flying of a fly. The violent, the aggressive, the wild. The one we all dont want to be in our lives, the one about whom our parents have warned us all our lives. The one who was supposed to fail sooner or later due to his anger and violence. None of the three I liked much in the beginning. Yet, two of them have proved me all wrong, writing their names in the pantheons of Indian cricket legends. Proved me all wrong and earned the grudging respect. 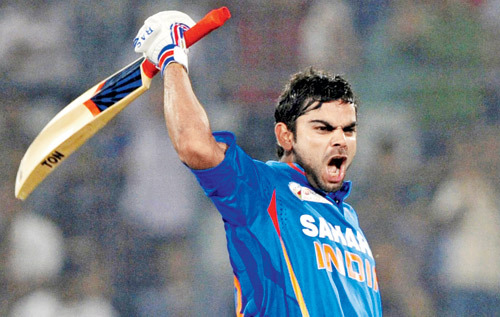 Kohli as a batsmen has done all he couldve done to prove me wrong. As a captain, I can only hope to again shower grudging respect on another player who wants to do things his own way and yet succeed belying all and sundry. His captaincy at Bangalore has never inspired much hope but we all know IPL is his undoing and its the national cap which brings out the best in the fiery lad.. I still don’t appreciate such a player but in the end, what we want is runs and wins from him. Here is wishing the New Crown Holder a glorious reign.